We are constantly striving to better our products and looking at materials which last for many more years than timber. We have discovered a heavy polyethylene pvc which has a life of 50+ years. These are in the form of heavy duty plastic pipes. For this product we have targeted the micro bats. The pipe is covered on the inside with a special render which in effect looks and feels like cement. On the inside the micro bats can easily scamper about with no trouble hanging on to the render. Also it is possible to open the top lid and peer inside to view the bats. It is obvious if they have been there because they will leave guano deposits on the bottom. Testing with temperature data probes inside the tube indicates it heats up very quickly but cannot retain the heat for long periods. This is expected for type of material used. 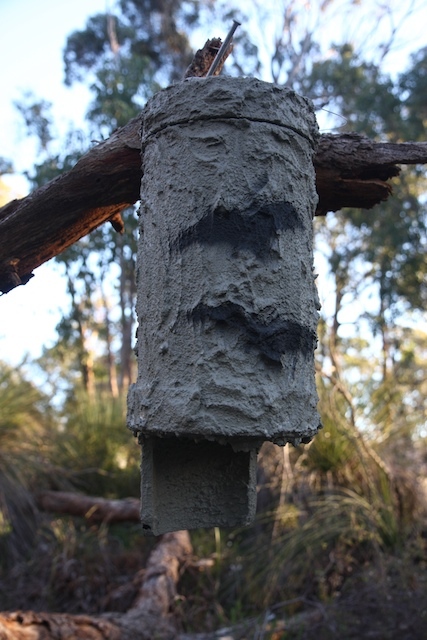 We predict it would be used by the bats as a winter roost. Several metropolitian bush sites have been chosen for installation. At John Forest National Park they have already have started coming. This entry was posted in Uncategorized and tagged PVC bat tube. Bookmark the permalink. Your articles are really awesome!, Thanks for sharing your interests; Thanks for your post!